Welcome to Bunny.nu » Blog Archive » Two stars are born! 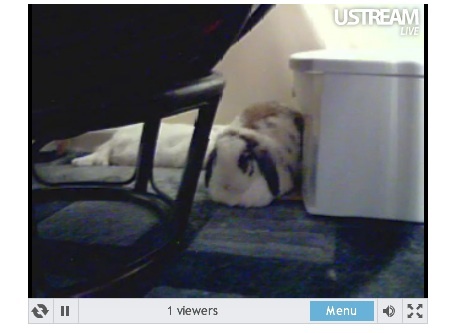 This entry was posted on Thursday, August 12th, 2010 at 8:10 pm	and is filed under Bunnies. You can follow any responses to this entry through the RSS 2.0 feed. You can leave a response, or trackback from your own site. My favourite show for the moment! Just pity that they live in a time-zone 6 hours after us. By the way: the still picture is not visible on my computer, why? My error, sorry! My Mac saved the screen capture as a TIFF picture, I guess not every computer handles that format. I have converted it to a JPEG now, test and see if it works better. It works just fine now – Betsy is supercute! So we will be happy watching Gus and Betsy! Yea Gus & Betsy!! Show the world what bunnies are made of! So cute, so tempting to set one up ourselves. I would just watch my buns all day while at work though. One of these days I will figure out how to set up a camera in the other room (and maybe make it have night-vision) so you can see the bunnies 24/7, so it won’t matter what time zone you’re in – you’ll always be able to see the bunnies. Great news, Keithius, thanks! We would love to see the snuggle-buns when they are locked in, too!